Ao Haru Ride is just another typical shoujo school romance with familiar repeated storylines, love rivals, predictable dialogue and generic characters. Does this mean this anime is not worth watching? Absolutely not. As someone who is guilty of watching many shoujo romances, I knew this anime would be put in my backlog the moment I heard it was coming out. 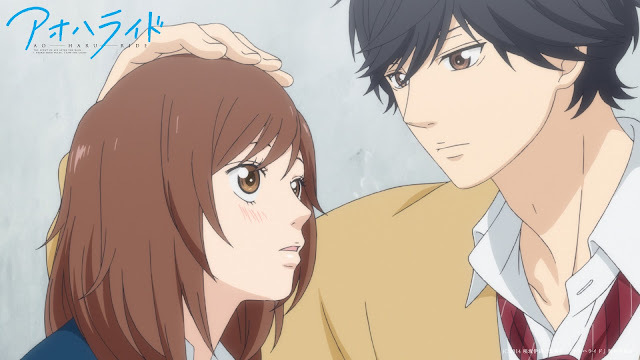 The story is about two former middle schooled students, Kou Mabuchi and Futaba Yoshioka, reuniting in high school who unintentionally rekindle their romance. Sounds familiar? Well it should because it's so generic. On top of that we have our typical love rivals and multiple proclamations of love between the main and supporting characters. As I was watching this I wondered why I consistently enjoy watching shoujou anime; you can predict the dialogue and you know exactly what's going to happen in each scene. After watching Ao Haru Ride I came to the conclusion that it's all about the characters and the quality of comedy. Although all the typical storylines with every shoujo romance has already been executed plenty of times in the anime world, it's all about the unique comedy that's keeps me coming back to watch more and more. I had a hard time trying to remember and episode where I did not laugh or find amusement in some of the scenes. With most anime adaptations the characters are animated similar to that of the art in the manga, there's nothing special in terms of this. However, Ao Haru Ride manages to add it's own eye-pleasing artistic touch by brining flashback scenes to life by using a watercolour art style to animate these parts of the anime. Now I must admit when the anime started I was a bit hesitant to continue after the first five minutes because this watercolour style was used. And if the anime continued as so, it might ruin my whole experience watching; yes the watercolour scenes were nice but it was too aesthetically pleasing to continue the anime if it were so. Little to my knowledge the first scene of the anime is a flashback scene and the anime goes on to present time without the watercolored style (as seen in the gifs). As with most shoujo anime, the sound and music are not standouts or even noticeable when watching. Ao Haru Ride is no exception to this. Although the opening and ending credits were very nice to listen to, the soundtrack was not a memorable one. Characters are what make or break an anime. With Ao Haru Ride, it was refreshing to learn that none of the characters were unlikeable (even the love rivals tugged on my heartstrings). The other reason why I said I enjoyed shoujo anime is because of the characters. In Ao Haru Ride the ultimate focus is the interesting relationship with the main characters, Kou and Futaba. Kou Mabuchi comes from a broken family, which has effected his personality and how he lives his everyday life - his effected personality branches with his love interest Futaba and causes rifts within their relationship. But as the anime progresses we see how Futaba resolves Kou's issues and ultimately transforms Kou's personality around for the better. If I could describe both Kou and Futaba's personality in one word, Kou would be reticent whereas Futaba would be complex. Ultimately it's the characters that orchestrate the enjoyment of an shoujo or any anime for that fact. All of them had either made me smile, laugh, or pay closely attention when watching. I happened to marathon this anime in one day if that says anything about how much I enjoyed this. As I was watching I didn't feel like the anime was rushed, even though it was 12 episodes - the fluidity from each story to story felt natural and not forced. If you're looking to add another shoujo to your list, watch Ao Haru Ride, you won't be disappointed. As always if you made it this far into the review, thanks for reading and feel free to leave of comment if you have feedback! Really nice review, keep up the good work!